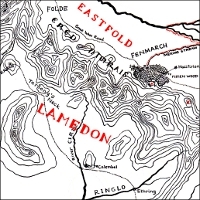 Lamedon, showing the road from Erech over Tarlang's Neck to Calembel. 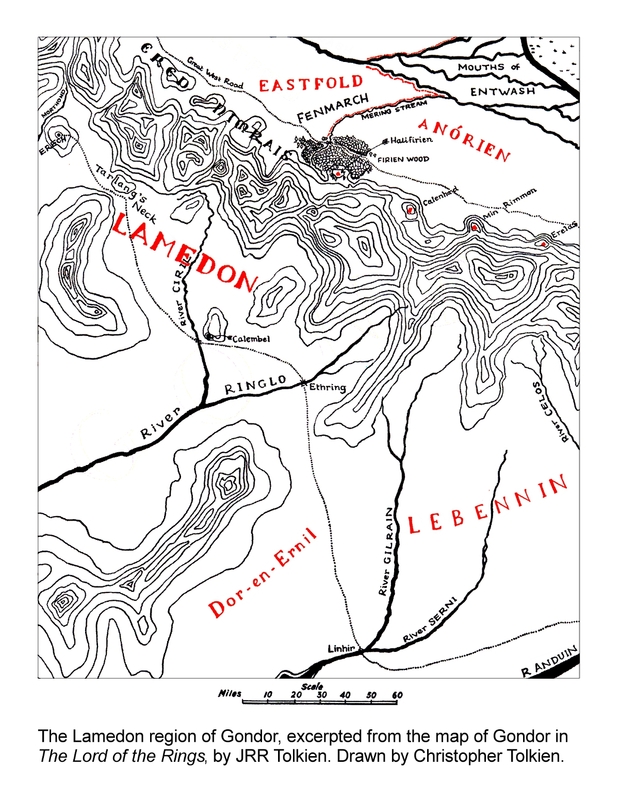 Aragorn sets out from Erech and comes to Calembel. '[We] rode from the Black Stone,' [Legolas] said. 'And lo! in the darkness of Mordor my hope rose; for in that gloom the Shadow Host seemed to grow stronger and more terrible to look upon. Some I saw riding, some striding, yet all moving with the same great speed.... In the uplands of Lamedon they overtook our horses, and swept round us, and would have passed us by, if Aragorn had not forbidden them. 'At his command they fell back. "Even the shades of Men are obedient to his will," I thought. "They may serve his needs yet!"